Bright Horizons offers a variety of skill-specific clinics throughout the year. These clinics are designed to provide independent Bright Horizons riders, plus other interested members of the local riding community, with half-day training sessions that are both educational and challenging. 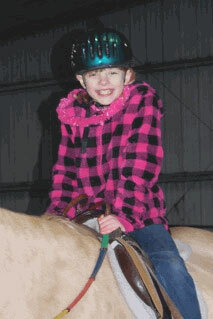 Previous Bright Horizons clinics have focused on a variety of skills appropriate for beginner through expert-level riders. For example: primary ground handling skills, barrel racing, roping, and advanced horse care. Have an Idea for a Clinic Topic? Bright Horizons instructors are always interested in applying their teaching skills to share their 50 plus years of combined horse experience with others. If you, or a group of people you know, have an idea for a clinic, contact us and we'll put you in touch with an instructor to see if there's sufficient interest to warrant our hosting a clinic. Annual Benefit Dinner and Silent Auction Each year we host a Valentine-themed Benefit Dinner and Silent Auction fundraiser. This event is generally held in Newport, Oregon - see Calendar for the exact date and location. Tickets are available, both online (on this webiste), by mail or at the Barn.